Porters two favorite football practices of the year happened last night and tonight. The temperatures dropped. 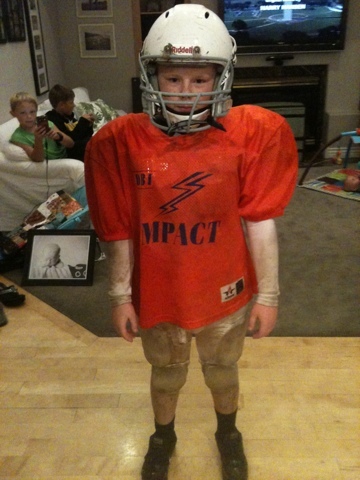 It has rained non stop, and the practice field is a muddy pit! 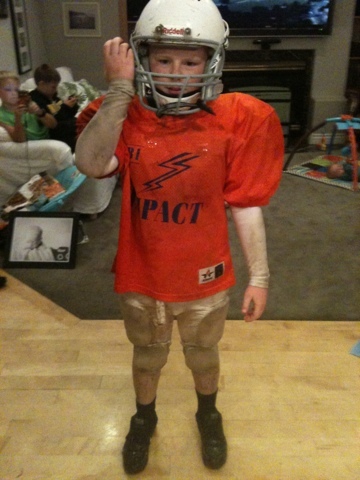 Apparently those are ideal football playing conditions! At least if you are an 11 year old! 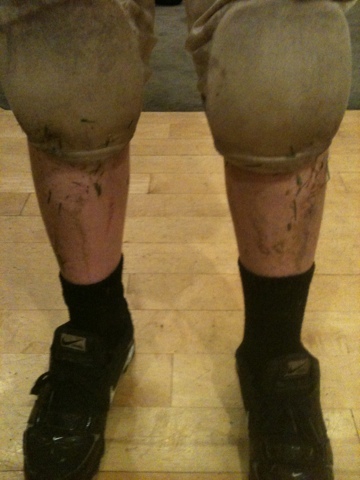 I sure love my muddy lineman! Are you looking for a last minute gift idea? A new boutique just opened in Eagle. It is called Lacelets. 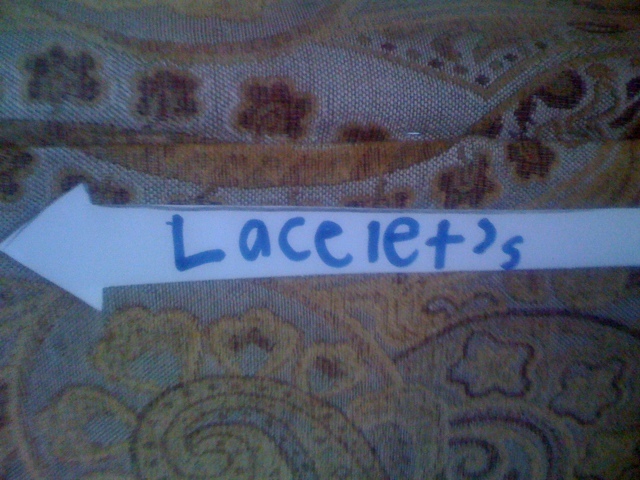 They specialize in custom made bracelets, anklets and shoelaces. 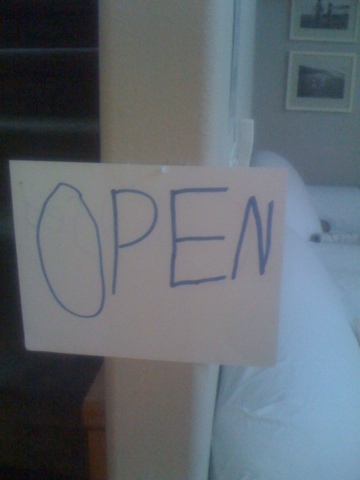 The advertising campaign for the store has been intense and professional. Check it out if youre're in the area! It is owned and managed by the same little entrepeneur that founded and operates the Library Finn. In the car the other day, quite out of the blue, Finn told me that he has a secret admirer. Me - Oh really? How do you know? Finn - Well today during recess, I had my head in one of the holes in the rock climbing wall on our playground, and someone came up and rubbed my back. When I turned around to see who it was, no one was there. So I think its a secret admirer. Me - Oh really? What makes you think its her? Finn - Well her name is Mrs. Meyer - Like Ad - Meyer- er so I'm pretty sure its her. Finn - (with eyebrows knit together) But why would Mrs. Meyer be running around on the playground? Me - Probably so she could rub your back. Seriously I will someday write a book about Finn who could be Junie B. Jones male counterpart. He totally cracks me up! - BTW he told me the other day that when he grows up and gets married he is going to change his last name to Jones. I asked why and he said it was because he wanted to have a little girl and name her Junie B, but Junie B McPherson doesn't make any sense at all. The last weekend before school ended we decided to go camping. We loaded up our car and headed out for Indian Springs, a very fun little camping spot near where my parents live. Our great friends, the Knittels, were attending a play that night, but agreed to pack up their family after the play and come and join us. What great friends to pack up their family at 9:30 at night and go camping. We arrived just after 10pm and started setting up camp, making smores, and running around with our friends. Finn and Labelle found a picnic table and sat down to catch up. The next morning the kids played in the hot spring run off water (and mud) and then we all went swimming in the Indian Springs pool. I have so many memories of swim lessons, and family outings there from my child hood. I really hope that our kids will have some fun memories from this weekend as well. In an attempt to catch up on blogging, I am going to attempt write a new post every day until I get caught up. Our family did a lot of fun stuff this summer, and I am feeling so guilty about not posting any of the details. Last weekend our fabulous friends the Knittels came to Boise for a visit. Right after they arrived we all sat down to dinner. Porter was asked to say the prayer and at the end he asked that we would have a great time with our friends, and that we would all get enough sleep to live. I know it is irreverent to laugh during prayers, but we couldn't help it. I am happy to report that our prayers were answered and we all got enough sleep to live - but just barely. We always have a great time with the Knittels! I really think I need to create a blog just for the funny things my little Finny does and says. I don't ever want to forget them, but I am afraid that the other 5 kids will look back and think this is a little (or a lot) lopsided. Until then....I can't help myself, this boy cracks me up. While I was mowing the lawn Finn finished scooping the poop and then put it in a grocery bag and deposited it in a garbage can where I also put the grass clippings. When he closed the can he waved his hand in front of his face and said "Phew, do not leave that open." I said "It really stinks huh?" Finn replied, "It WREAKS!" 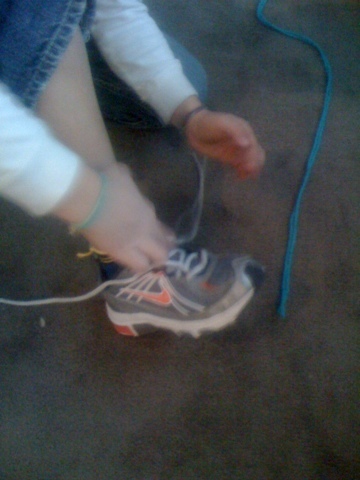 Then he took two more steps and added, "like my FEET!" Anyway...Finn cooked a marshmallow but asked my mom not to make his smore without graham crackers. She said, "well Finn that is kind of against the rules." He responded, "In all of marshmallow history?" After the smores were eaten Finn was burning off one of the roasting sticks. He pushed all of the burning sticks around and then invited everyone to come and stand around the burning embers to talk about his birthday tomorrow. Tonight while she was busy playing with her cousins Livy had a wet pants accident. I was helping her clean up, and asked her if she had just gotten busy playing and didn't want to stop to go to the bathroom until it was to late. She said "yes." While cleaning her up I continued and said "I understand that. It used to happen to me a lot when I was a little girl." Finn had come up behind me and yelled out, "IT STILL DOES!!!" I was laughing so hard that I couldn't remind him that he needs to keep that little piece of info secret.